Based at the North Down Cricket Club, Gillian Anderton Physiotherapy doesn’t just treat sports injuries and athletes but a wide range of patients and ailments ranging from long standing problems to very recent injuries. 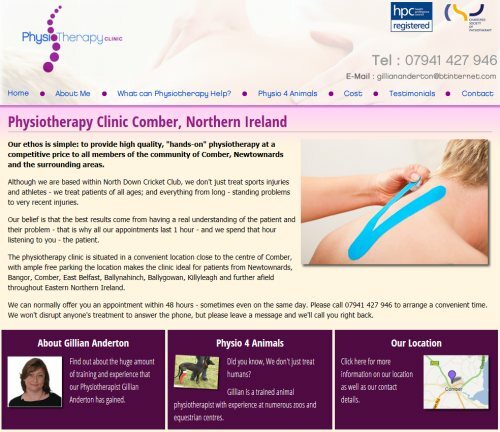 The physiotherapy clinic is situated in a convenient location close to the centre of Comber, with ample free parking the location makes the clinic ideal for patients from the Local Area and beyond. We produced an eyecatching and attractive site which Gillian will use to promote her services to customers throughout North Down and Belfast. One interesting side of Gillian’s work is treating Animals and the website gives details on this. An interactive online map is included.